Don McCullin becomes a knight of the Realm…. I must confess to a lack of enthusiasm for the Queen’s Honours List in recent years, far too many (sport in particular) are splashed out too soon and its importance seems to have diminished. A Knighthood should be a very special award, in most cases I believe it should reflect a lifetime of work and not just a sporting achievement. Can we not wait for a tennis player of cyclist to retire but calling them a ‘sir’? This dilution seems commensurate with so much else in society, be it education, work, media, politics and so on. Will we, I wonder, reach a point where nothing means anything at all? 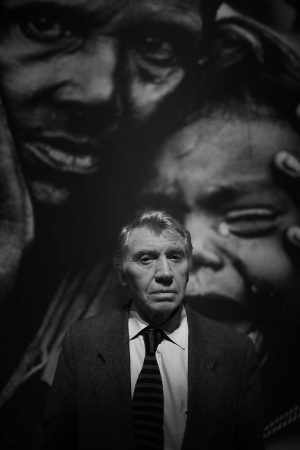 If we do reach that point then at least we can all agree that the Knighthood given to Don McCullin in the 2017 New Year’s Honours List is indeed thoroughly deserved. A man whom I have mentioned on more than one occasion here is one of Britain’s greatest ever reportage photographers. In a career spanning more than sixty years he has brought to our living rooms statement making images of war in the 20th century which few have managed to equal. McCullin grew up in World War Two Britain, fought the hardships of everyday life in the capitol and thus pulled few punches in his documenting of the suffering of those stricken by poverty, sickness and war. “Photography has been very, very generous to me. But at the same time it has damaged me” To look at McCullin’s images, particularly those from the early Sixties in Vietnam through to Biafra in the Seventies it seems impossible not to be affected as deeply as he was by what he saw. He faced a continual battle within himself, when to stop photographing, when to help, how to walk away. What McCullin must have seen beyond what he photographed one can only begin to imagine. But what he did photograph he did with compassion and respect. Last year he travelled to Iraq to photograph the fighting in and around Mosul, at eighty one years of age. Don McCullin deserves to be called Sir wherever he goes, the world owes it to him, not just the Queen.